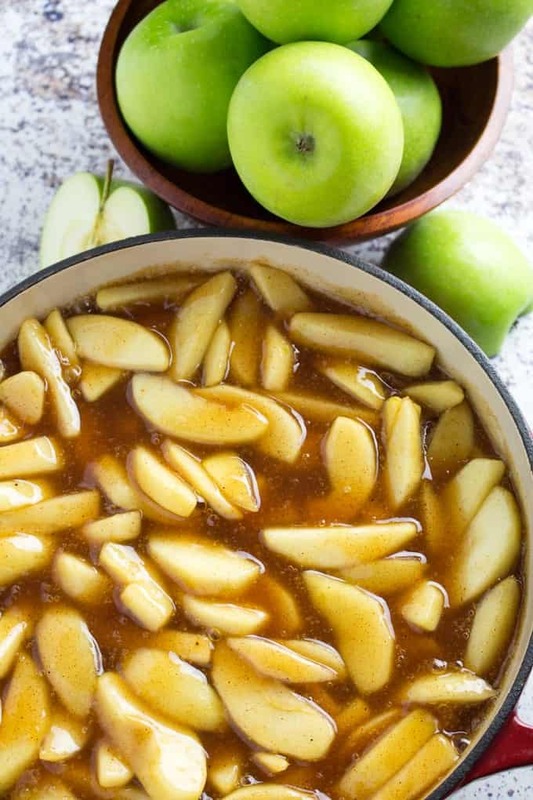 Homemade Apple Pie Filling Recipe is soft sweet granny smith apples simmered in brown sugar right on your stovetop. It’s easy to make ahead and freeze, and ready in only 20 minutes! You can use my Gluten Free Pie Crust with this apple pie filling. You can also serve this Easy Pumpkin Pie Dip alongside it! 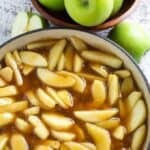 Homemade Apple Pie Filling Recipe is the perfect gluten free pie filling to have in your arsenal for the holidays. I like to make a big batch of this at the beginning of apple season and freeze it in portions big enough for 1-2 pies. This recipe will make about 2 pies itself. That is, if you can resist eating it with a spoon first! Plus, you know it’s 100% gluten free! So you don’t have to worry about what went into a can, because you make it from scratch. 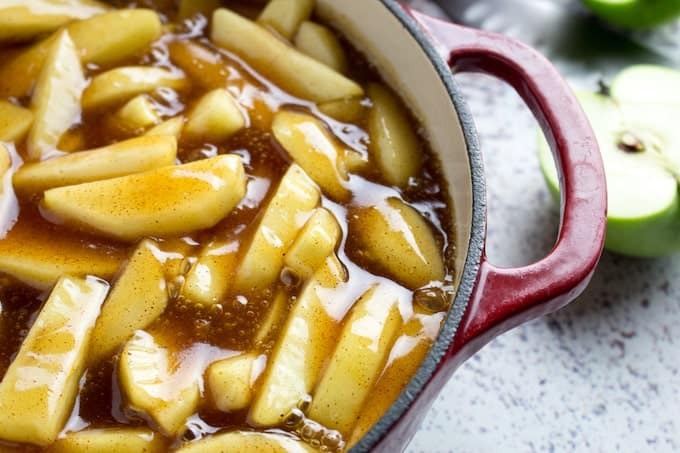 How to make apple pie filling on the stove? Learning how to make apple pie filling is easy! You’ll wonder why you ever bought canned filling to begin with. Core, peel, and slice your apples. Stir them together in a bowl with lemon juice. This helps keep them from browning! Whisk together sugar, water, cinnamon, nutmeg, and salt in a dutch oven, then turn heat to medium. 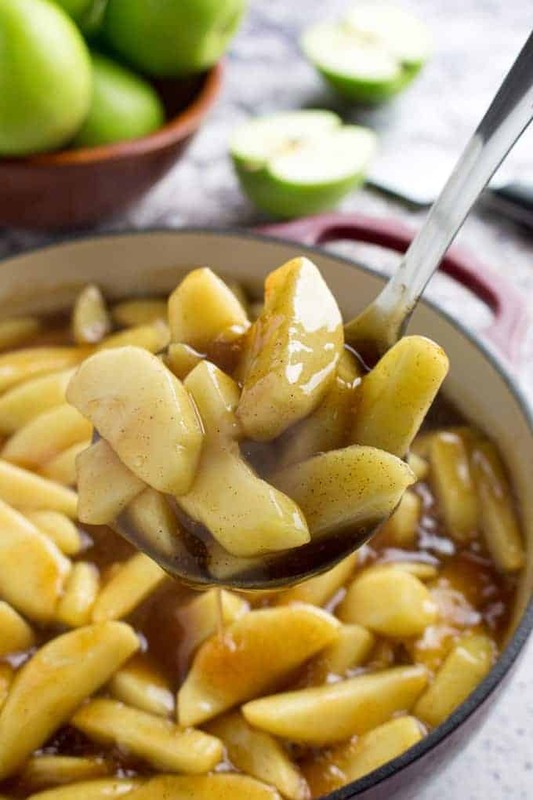 Bring to a boil, then add apples and simmer until apples are soft. Allow to cool before using in a pie, or freezing. That’s it! That’s all you need to do to learn how to make apple pie filling. I said it was easy, didn’t I? 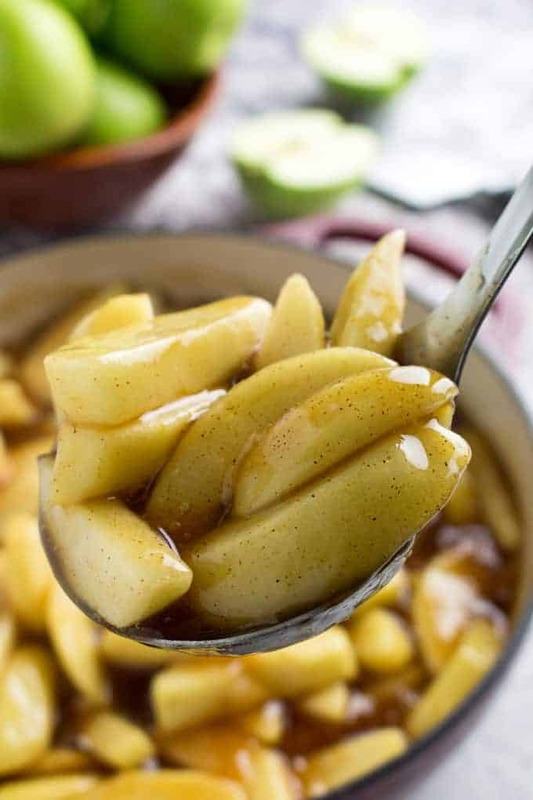 My personal favorite type of apple for this apple pie filling recipe is the granny smith apple. They are bright green, firm, and have the perfect amount of sweet and tart. They’re also really easy to find at your local grocery store, which is a plus! If you don’t want to use granny smith, you can also try Honeycrisp, Jonagold, or Mcintosh. How long can apple pie filling last in the fridge? Homemade apple pie filling from scratch will keep in the fridge for 4-5 days. If you’re going to make this way ahead of time, I recommend sealing it in an air-tight container and freezing it. Homemade apple pie filling will last 2-3 months in the freezer. 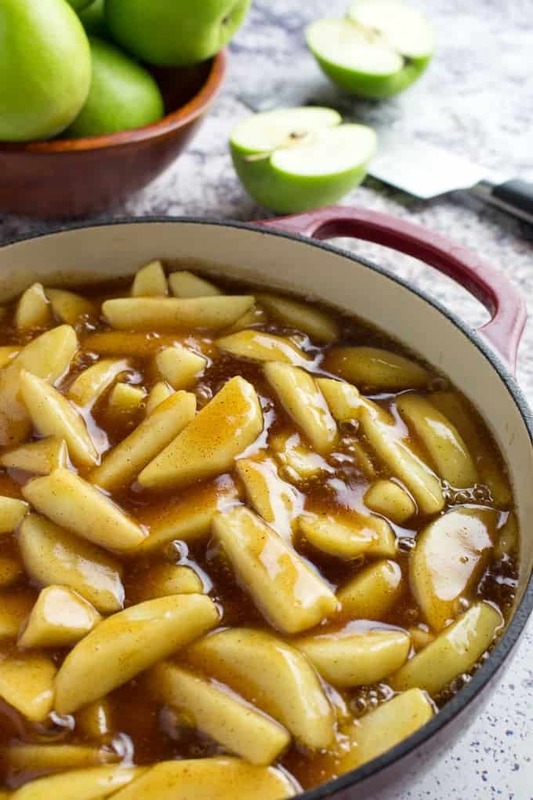 How do you can apple pie filling? Sterilize your materials (cans, lids, rings). You can do this by boiling them in a pot of water. Instead of cooking your apples, put raw apple slices in the jar, leaving some space on top. Cook your syrup until boiling, then pour into jars. Use a butter knife to clear any air bubbles out. Put lids on jars and place them in a water bath canner for about 20 minutes. And that’s it! Canning apple pie filling from scratch can take some practice, but once you know how to do it, it’s really not so bad! 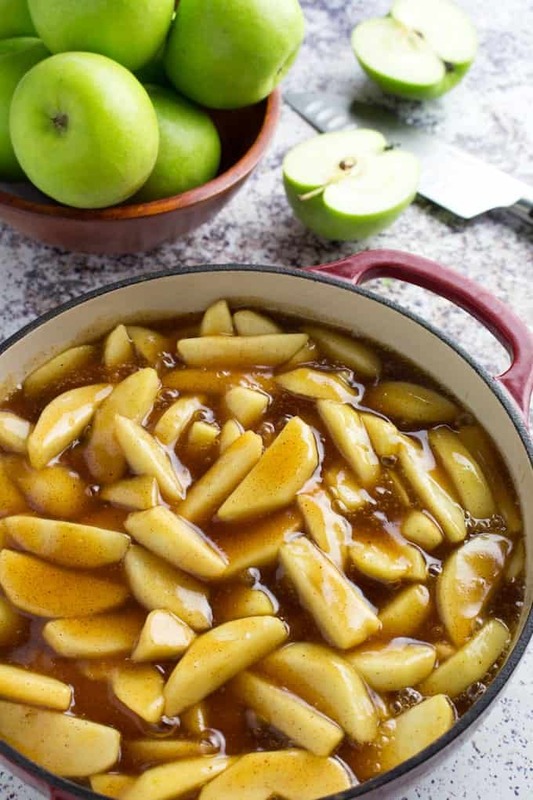 Homemade Apple Pie Filling Recipe is soft sweet granny smith apples simmered in brown sugar right on your stovetop. It's easy to make ahead and freeze, and ready in only 20 minutes! In a bowl stir together apples and lemon juice. Set aside. In a large dutch oven, before turning heat on, whisk together water, corn starch, sugar, cinnamon, nutmeg, and salt. Turn heat on to medium and bring to a boil, whisking continuously. Add apples and simmer 8-10 minutes, stirring often, until apples are soft. Remove from heat and cool. You can freeze or can this to use later!